Here are the photos I've been promising. First up is the x260 Invicta,, then the2245 Super Rock, followed by the two black Workingman x290s, with 3 pics of the 2nd and nicest one that I bought and more pics of the 1st one. The Workingman guitars both play and sound great. The older one has plenty of scars, including an upper strap button that is bent and needs the hole filled and redrilled and a new button. The truss rod cover is missing, so I will copy the other one and make one out of black ABS. It also has hairline cracks in the finish at the neck joint where it curves into what I'll call the "ears" at the very top of the body. A guitar tech with lots of experience told me not to worry about it. Oddly enough, now the new one, has developed the same cracks, possibly from change in climate from Indiana to San Francisco area? I tried to show them in a few pics of the older one, but not sure you can see them. The better of the two was made in 1983. Not sure about the other one. As you can see, the bridge on the 2245 is very corroded, but I have replaced it with one from Guitar Fetish. I bought the B04 model Gotoh copy. One of the saddles on the old one actually had two notches instead of one. One thing that caught me off guard, is that the posts of the new bridge, that screw into the anchor sockets, have a much shorter length of threaded rod. So it isn't in by as many turns as the original. Also, I think the stop tail piece needed to be raised to lessen the angle of the strings to the bridge saddles. I have done that, but was wondering if there is a correct angle it should be. The old bridge has one of those wire springs that hold the saddle mechanisms in place. - Like the Gibson ABR-1 Tune-O-Matic. Some of the strings were actually touching that, because of the steep angle. Next, I will replace the nut. Someone botched a shim and reinstall of it, so I will buy a new pre-notched one and finish the notches myself. The Invicta came without an output jack and electronics cavity covers on the back. I made new covers from ABS plastic, and the jack has been replaced. Last edited by Sailrick on Fri May 18, 2018 10:16 pm, edited 20 times in total. Here is the newer and nicer Workingman I bought. This one didn't need any setup. Last edited by Sailrick on Fri May 18, 2018 10:49 pm, edited 4 times in total. Nice guitars there, thanks for sharing them! Good stuff, thanks for taking the time to post. About the stop tail angle, there are different opinions but I've heard that the more severe the angle (lowest height), the more force on the bridge, which in theory should give you the best sustain. Your milage may vary, and if you find yourself busting strings, you might want to raise it up. If you turn the bridge around (I realize you've already replaced it) the strings wouldn't touch the saddle adjustment screws or retaining wire. 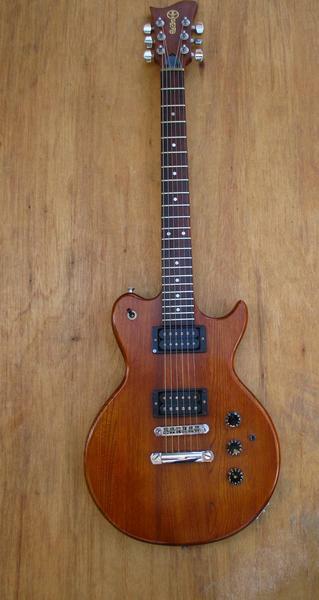 Those gibby style stop tails were designed for the strings to wrap over the top, which I always thought was ridiculous. It's putting less force on the bridge, and makes it a pain to change strings that way, but lots of players string them that way, so maybe I'm missing something. Curiously, the original '52 Pauls had a crazy wrap-UNDER bridge, something that Lester came up with himself, and thankfully never caught on. Cheers, Mike. Regarding the tailpiece, I only raised it enough to clear the retainer wire on the bridge, maybe slightly more. I traced the string angle from one of my Workingmen on a piece of paper and used that as a guide. The new bridge actually has the intonation screws on the front side, rather than toward the tailpiece. I suppose that could be changed by switching the saddles around and from end to end. I think I'll leave it alone though. One other thing surprised me. I have had the bridges off all the guitars before, but had never unscrewed a post from its socket. At first I thought there was a misfit because the posts of the new bridge were so loose when screwed in. So I screwed the old one back in to compare and it was the same. I assume this is normal and is so for a reason? I'm a little concerned that the shorter posts may tend to lever the sockets away from the wood on one side, due to string tension. Tilt them in other words. I tried the string over tailpiece thing recently, on my X230. It caused the body poly to crack, emanating out from the tailpiece stud! From raising the tailpiece, it changes the amount of stress on the stud and body, puts more pressure on the insertion point. photos of the Electra warranty tag that came with the nice Workingman, that I bought on Reverb. I had previously said that it was built in 1983, but now I think it was August 1980, based on the serial number. SLM adjusted it in 1983.
and the tail piece post socket that has lifted slightly on one side. I noticed it just before I put the new bridge on. That's why I was concerned about the bridge sockets, with the posts not all the way in. Last edited by Sailrick on Fri May 18, 2018 11:11 pm, edited 4 times in total. Want to see who did the set up and adjustment? 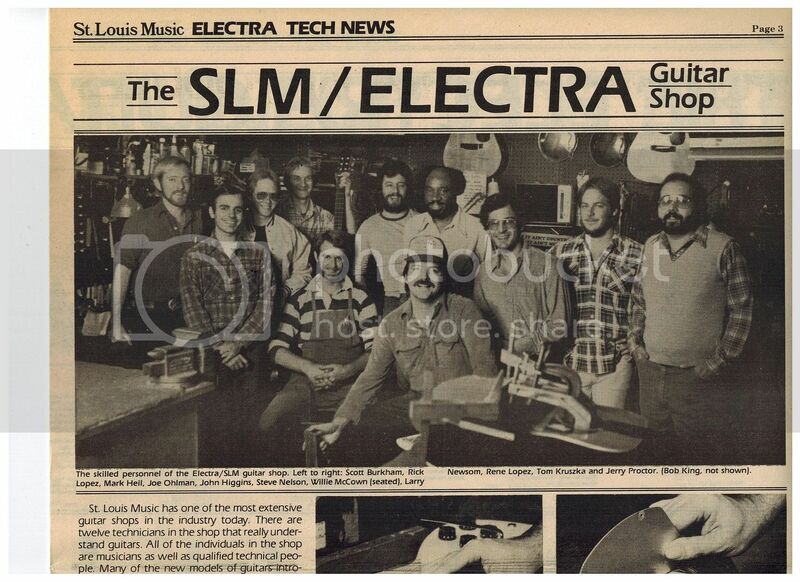 Your guitar was set up by Tom Kruszka, the second guy in from the right! To his left is the most famous of the Electra boys, the legend himself... Rene Lopez! I second that!! That's a choice bit of ephemera, Chad... nice one!! I scored on that lot of literature, so cool! Cool guitars and cool clipping. I try to set the tail piece as low as I can while still clearing the back of the bridge. What a cool photo, I've never seen it before! I've met Rick Lopez and Jerry Proctor, and have recorded John Higgins in the studio several times! John plays a lot of gigs around town on both guitar as well as pedal steel, and is an excellent luthier. He's the go-to guy around here if you want a vintage Martin neck reset.